So when we left off yesterday, I was revved and ready to run a longer run, only to find out that my Garmin 305 wouldn't turn on. I was completely upset not only that my Garmin was broken, but that I had my heart set on a long run that would challenge me, and now I couldn't even measure how long I'd run or my pace! I finally decided that the run had to happen, Garmin or not. I remembered that I had downloaded the Run Keeper app during one of the times I was super pissed at the Garmin for taking almost 5 minutes to find satellites on a sunny day. I thought it would be the perfect thing in a pinch, so I enabled the GPS on my phone and went to use the app. It...is...worthless. I was standing on a busy street on a gorgeous sunny day, and it kept saying that it couldn't find my location! I'm obviously not going to give away where I live, but let's just say that it's not in the middle of the boons, and that any GPS worth its salt should be able to find my location! I tinkered with it for a bit and finally the signal conceded that it was "poor", but at least existed. So off I went, and I couldn't believe how good my legs felt! It was night and day from my two previous runs, and it made me scold myself extra hard for ignoring my Yin Yoga DVD for so long! I felt so good once I got going I decided that I was going to do 7 miles, which would be the longest distance I've ever run in my life. I checked my phone and the Run Keeper app until I hit 3.5 miles, then turned around. The last couple of miles was really rough, and I was walking a lot more than I was running, but I could still didn't feel that overwhelmed. I was just super stoked and proud that I pushed myself at all. I was almost home when I looked at my phone and saw that my supposed distance was 6.5 miles. I was just like "whaa???" I turned around at a little past 3.5 miles, which meant that I should have been at 7 miles by then. I mean I am horrible at math, but even I know that 3.5 miles out and 3.5 miles back should equal 7! That's when I realized that the Run Keeper app is officially horseshit, and it made me really sad and really mad at the same time. My heart sank when I realized that I probably had not run 7 miles at all, but probably a lesser distance. Sure enough, when I came in and checked a couple different run mapping sites, they had the distance in the 5.88 to 5.93 mile range. I was SO upset. I really thought I'd challenged myself and done the longest distance ever in my life, instead, I didn't even do a 10k. I sulked for a long time and was really pissed, but then I decided to just snap out of it. While I didn't hit the long distance I set out to hit, I did do the longest distance I've done this year since I started training. I got up on a sunny Sunday morning and ran instead of staying on the couch watching a Game of Thrones marathon. I could have just said "screw it" when my Garmin broke, but instead made do with what I had (even if what I had sucked!) And once I came in, I ate a healthy lunch and a couple of healthy treats (popcorn and strawberry "ice cream" made with yogurt and frozen strawberries) instead of walking to the local burger joint like I wanted to. I also lost 5 pounds this week, and THAT'S something to be happy and proud of. 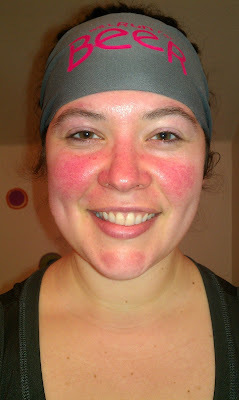 I took a picture of myself after I was done running...you've got to love a good post-run lobster face! Even though my skin looks like a tomato I actually kind of like this picture. My face looks thin, and I look happy despite how irritated I was about the GPS shenanigans. And since I think everyone likes a happy ending, I can tell you that not all technology is a huge fail. I poked around on the internet and looked to see if anyone else with the Garmin 305 had issues with it not turning on. After reading advice on a couple of running blogs, I am happy to report that I was able to get my Garmin working again! I literally had to hold down a couple of buttons while pushing another on and off, but when it lit up and turned back on, I just about had a parade outside of my house. I wish I had done that before my run, but all's well that ends well I guess! i had that same thing happen to my Garmin once. I seriously wanted to cry when I thought it was dead forever. Then wanted to do some sort of cheer or something when I magically revived it. (maybe i'm a little overly dramatic?) Good job and getting out there and running without your Garmin. I know for me that because a great excuse to just saw screw it and sit on the couch instead of run. I am so glad I read the whole thing before commenting because I've had that Garmin problem before and solved it. Guess they are just like smartphones and need to be reset every once in a while or they are jerks! Sorry about the runkeeper inaccuracy. I totally hate running without gps because I like seeing the numbers. I feel like I don't credit for it otherwise! Good job on getting out there anyway and ran your longest of the year! Yes, I just about had a stroke when I couldn't turn on my Garmin. Words were definitely said! Thank God for the Internet sometimes, seems like it is a common issue. I use the MapMyRun app on my iPhone, and it is awesome. In almost a year of using it 3-4 times/week, I have only ever had an issue with it once. Saw you on Motivational Monday on Katie's site... excellent job on your six miles! So what it wasn't 7.. you made no excuses and you put the effort in! YEAH YOU! Oh! I use an app called Digifit and have been very happy with it... it might work for you as a backup to your Garmin... I use it with my bluetooth heart monitor.. anyhoo.. good luck! Technology is so awesome and yet so frustrating at the same time, isn't it? I have TWO Garmins, and they both drive me batty in my neighborhood. The only time they find a signal really quickly is in big cities. But anyway. I'm sorry you didn't get your 7, but nearly 6 is still awesome, any day of the week!